Ore futures for China, the world’s largest consumer, dropped over 3% a record low, while the steel-making ingredient with content rate of 62% delivered to the port of Qingdao dropped 1.2% to $69.58 a dry metric ton today, the lowest so far since June 2009, data from Metal Bulletin (subs. required) shows. This is almost two-thirds below a peak of $191.90 reached in February 2011, which was when huge new mines were being approved. Prices are heading for a 13% loss this month, the most since May. The commodity has lost 48% of its value this year. According to Bloomberg, prices are heading for a 13% loss this month, the most since May. The commodity has lost 48% of its value this year. Analysts predict that the situation won’t improve much next year. Some global miners such as Rio Tinto (LON:RIO) have said they will ramp up supply by roughly 10%, mostly in the first half of next year, based on Citigroup estimates. This, more than worries about demand, has the futures market predicting that iron ore will be down another 5%, CME Group data shows. 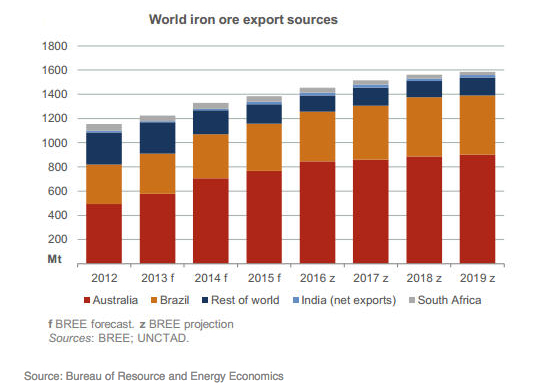 Over the next five years Australia’s iron ore exports are projected to increase at an average annual rate of 5% and total 900 million tonnes in 2019.